Upcoming Program: Tuesday March 27, 2018. 7:00PM at the Boyden Library at the corner of Bird and Baker Streets. Jim Murphy, longtime Foxborough resident, will present his experiences at this dream job with the New England Patriot’s team for 13 years, working alongside players, coaches and staff. He will share his experiences from participations in Super Bowls to visits to the White House and to celebrations at Ring Ceremonies. A selection of Patriots memorabilia will be on display during the presentation. Please consider joining us on the 27th in the Community Room. Past Program: Tuesday September 26, 2017. 7:30PM at the Boyden Library at the corner of Bird and Baker Streets. Historian William Hanna presents "The WWII POW Experience at Camp Myles Standish"
William Hanna will join the historical society on Tuesday to discuss "The World War II Prisoner of War Experience at Camp Myles Standish." Hanna will share his research on the massive military site that was Camp Myles Standish in Taunton. More than 1,500,000 American soldiers passed through the camp during World War II on their way to Europe, and thousands of German and Italian soldiers were detained at the camp during the war. Hanna plans to relay details of prisoner camp life during these years noting "The prisoner of war aspect has been less well investigated so I am going to try to take care of that." Please consider joining us on the 26th in the Community Room. 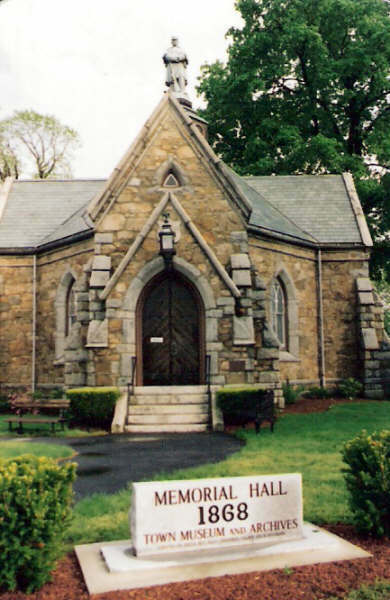 Images appearing on this website may not be reproduced in any manner without express written permission from the Foxborough Historical Commission.